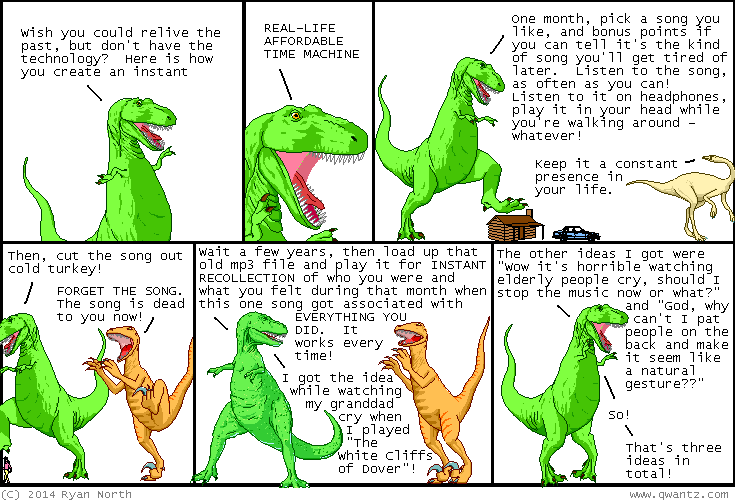 Dinosaur Comics - February 12th, 2014 - awesome fun times! February 12th, 2014: Yesterday Emily and Joey and I were guest lecturers at Trent University and we talked about remixing and it was a lot of fun! If you weren't there TOO BAD, you had to be signed up for the class anyway. The only way to increase your odds of addending such a lecture in the future is to sign up for all sorts of classes and degrees at every university you can. Maybe do a few extra degrees, you know? ?